The New Mexico Spaceport Authority (NMSA) today dedicated the nearly two-mile long “Governor Bill RIchardson Spaceway” at Spaceport America, representing significant progress toward launching commercial customers into space from the desert of New Mexico. 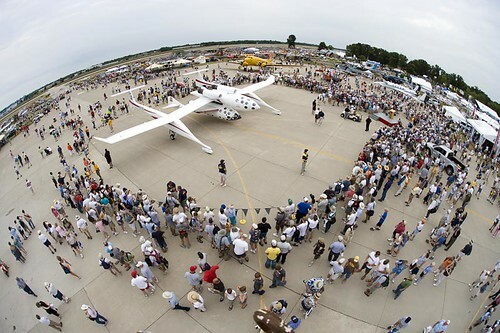 Governor Bill Richardson, Sir Richard Branson and approximately 30 of more than 380 Virgin Galactic future astronauts attended the event along with guests from around the world and watched a flyover and landing by Virgin Galactic’s WhiteKnightTwo, in a captive carry with SpaceShipTwo. They’ve got 380 "future astronauts?" Not too shabby. Going into Friday, an unanswered question lingered in the air at Spaceport America: Would Virgin Galactic’s carrier plane and spaceship actually touch down on their inaugural visit to – dare we say – a "virgin" runway? Since March, officials had advertised that the vehicles, WhiteKnightTwo and SpaceshipTwo, would participate in a "flyover" at Friday’s runway dedication ceremony. And sure enough, soon after arriving in spaceport air space, the vehicles were piloted over the runway and nearby 600-person crowd several times. After catering plenty to the spectators and their cameras, the plane disappeared out of sight, presumably to start the 800-mile trip back to Mojave, Calif., its home base. "I rang the pilot of the spaceship and said, ‘Look, we’ve got a runway here. Why are you going back to Mojave? Why can’t you come and sort of show it off?" Branson then encouraged the audience to put their own "vibes" into the sky, in an attempt to persuade the pilots to turn back and get them to land. The audience obliged, seemingly eagerly, with cheers and squinching finger motions to send out their "vibes." A few people busted out in a jig. About 10 minutes later, Branson again told the audience to send out vibes and clap until the aircraft returned. And, after a couple minutes of clapping, the plane and spaceship were back in sight. Not long after, the duo had landed. A plan was in the works all along for WhiteKnightTwo to touch down on the runway, said an official with Scaled Composites, the company partnering with Virgin Galactic to build the airplane. WhiteKnightTwo, carrying SpaceshipTwo, wasn’t the first aircraft to land on the new, 10,000-foot runway. Earlier in the day, Branson, New Mexico Gov. Bill Richardson and other dignitaries arrived at the ceremony in Branson’s plane, "Galactic Girl." And a spaceport official said another smaller aircraft has landed previously. This entry was posted on Monday, October 25th, 2010 at 5:44 am	and is filed under Analog Deathwatch, Front Page. You can follow any responses to this entry through the RSS 2.0 feed. You can leave a response, or trackback from your own site.